A beautiful Monday to everyone! Traveling with Air Asia low fares is awesome as we can use the money save on flight for other travel expenses. So, for how about checking this latest Air Asia promo fares 2018 for domestic and international trips? Yes, the ongoing promo of the airline are good for travel on February, March, April, May, June, July, August 2018! Thus, you may avail affordable fares for your summer vacation. Want to know the holiday and long weekends for 2018? Check HERE. Booking for the promo fares is until August 27. However, since Air Asia sale tickets are limited, it is best to book tickets ASAP. 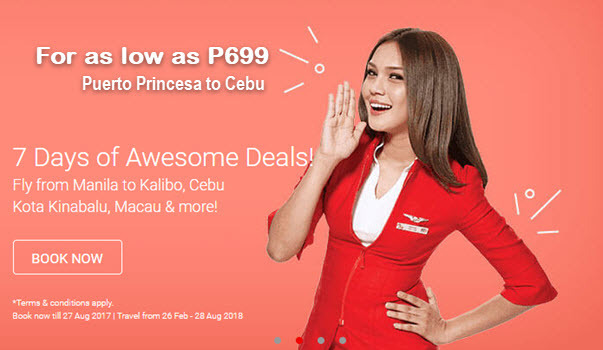 Cebu is the featured destination on this promo. For as low as P699, fly from Puerto Princesa to Cebu. 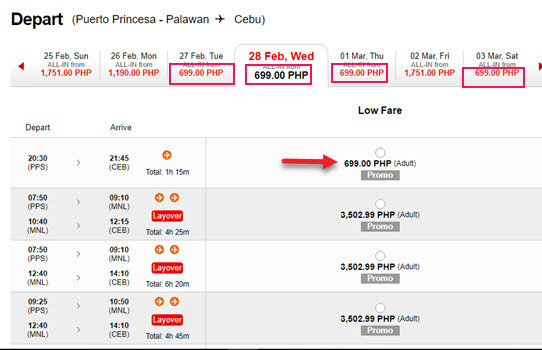 From Davao, travel to Cebu for only P790. 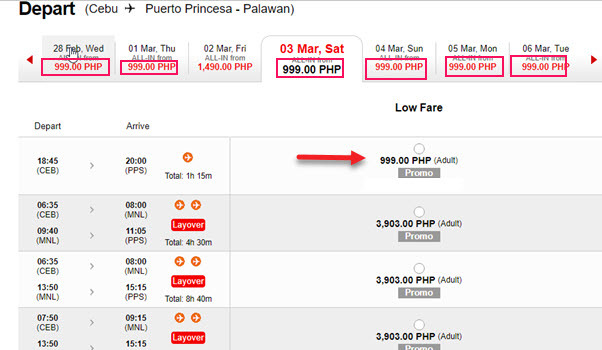 Return flight to Puerto Princesa cost P999 while Davao journey from Cebu is only P1,099. Check below sample Air Asia ticket booking to show you that this seat sale is legit. To avail the Air Asia promo fares, you must book in advance at the airline website: www.airasia.com where you can book without a Promo Code. Sale tickets of Air Asia are valid for one-way trip and cover the base fare, Aviation Security Fees, taxes & fees and free 7 kilos hand carry bag. Aside from the above promo, Air Asia has another ongoing special sale for the new route Manila to Iloilo and vice versa. Avail as low as P814 promo fare for Manila to Iloilo and P999 promo fare Iloilo to Manila. Book the sale tickets until August 27 and travel from October 1, 2017 until August 28, 2017. Go online now and book the low fares! You can pay sale tickets with your credit card; or via DragonPay facility (internet banking). You may also choose to pay at Air Asia Payment Partners: Bayad Center, 7-Eleven, Cebuana Lhuillier, SM Store, EC Pay, M Lhuillier, and Robinson’s Store. Do you have any concern or inquiry? Feel free to call Air Asia hotline number: (63-2) 722 2742 from 7AM-11PM. Want to receive updates on airline seat sale? To get updates on Air Asia, Cebu Pacific Air, Philippine Airlines promo fares 2017, seat sale 2018, Piso Fare and travel info, Like and Follow our Facebook: PISO FARE TICKET!